New York: Columbia Broadcasting System (CBS), 1949. 1st. Original Wraps. Collectible; Fine. Fascinating 1949 CBS prospectus on its national radio program on the inadequacies of the mental healthcare system. 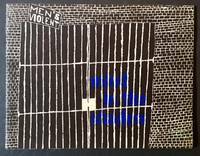 Artfully done, with Ben Shahn supplementing the text with his poignant illustrations. A clean, Near Fine quarto in its stapled wrappers. New York: Charles Scribner, 1938. Cloth. Collectible; Very Good/Very Good. WARMLY INSCRIBED BY WESTBROOK PEGLER IN YEAR-OF-PUBLICATION on the front free endpaper. A solid copy to boot of the 1938 1st edition. Tight and VG (with offsetting to the gutters and light foxing at the pastedowns) in a bright, price-intact, VG- dustjacket, with light chipping at the spine crown and mild darkening to the spine. Thick octavo, 332 pgs. Signed by Author.